Welsh band Doll Circus have just released their debut self-titled 6 track EP. Formed in 2013, band members Jamie (Guitar, Vocals), Jake (Bass, Vocals), William (Lead Guitar) and Doug (Drums) take their influences from an alternative sound and have produced an EP that is packed with melodic sounding guitars, as well as great sounding harmonies. Tracks such as ‘Top Of The Hill’ and ‘Brain On Fire’ have a lighter tone with an undercurrent of an indie vibe to them, before the infectious sounding songs such as ‘Bonnie Hunt’ and ‘Chemical Mindfreeze’ get into your head from the very first listen with their grooving bass lines. 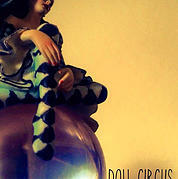 Overall the tracks have a nice upbeat tone to them and this is a strong sounding debut EP from Doll Circus.